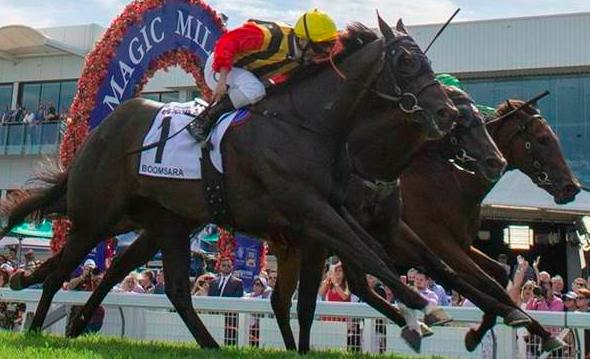 The big Magic Millions Raceday saw riches staying in Queensland after Munce Racing had a massive pay day when BOOMSARA scored in thrilling style. It was a fill up at Randwick for miStable clients starting with Kirkup Racing in the Highway Handicap after SMART AS notched her fourth win. Racing fresh continues to look the trick for SINGLE BULLET who gave Portelli Racing a dominant winner over cult figure Jungle Edge. Meanwhile Snowden Racing didn't miss out when ONSLAUGHT and Christian Reith raced close to the speed and scored,Brideoake Racing took a win with EXTREME BLISS while Robbie Dollan had TURNBERRY midfield for Lees Racing to win the last. OâTAUTO is building a lovely record and Greg Eurell managed to add a Flemington win to his CV for favourite backers. The days feature the Chester Manifold saw a huge performance from MANOLO BLAHNIQ to sit three wide on speed to win in brilliant fashion for Tony Noonan. Gawler was a happy hunting ground for Leon MacDonald & Andrew Gluyas after consistent galloper WASABI BOB won his eighth race. Another training partnership joined forces in the last when Richard Jolly & Chantelle Jolly prepared KEMALPASA to a solid win. SECOND BULLET came in strong for Danny O'Brien along with I AM SOMEONE for Paul Preusker plus Grant and Alana Williams notching up a win with SALLY'S REALM. A shout out to Neville Parnham trained WRINKLY who won the Mandurah Cup in WA while Scott Brunton prepared JEREMIAH to a popular maiden win and MARBEL DUKE gave Gary Clarke success in the red centre and MR MARKOU scored for Victory Thoroughbreds whilst Roy Rogers trained CAPTAIN STIRLING followed through also with a win. Congratulations to all our overseas winners Dan Meagher, Stephen Gray, James F Peters in Singapore and Glen Kotzen, Brett Crawford, Sean Tarry in South Africa.